A Gourmet Three Course #TasteofTravel Menu with Celebrity Cruises – Why Waste Annual Leave? Travel has always been in my bones, from the early years of an unusual upbringing in Saudi Arabia to the summer holidays I would spend escaping London and living a simpler life in small-town India. One of these days, I will share with you the travel journal I found written by a tinier (but no less chatty) version of myself at the tender age of nine, working on a travel blog of sorts long before I’d even heard of the word, ‘internet’. My gastronomic interest though, took a different path, one I struggle to retrace. All I know is that when I visited Barcelona in 2002, I wasn’t even remotely bothered about food. And yet here we are in 2014, recently home from a trip to Asia, where my ever-patient Pumpkin spent a whole afternoon in Singapore helping me chase after a cream puff! Don’t ask. Somewhere in the last decade, I developed a love of world cuisines and now, wherever I am on my travels, I enjoy trying local specialties. When Char from the fabulous Taylor Hearts Travel blog nominated me to share my global three course menu as part of the Celebrity Cruises #TasteofTravel competition, I was more than happy to oblige. For one, I’ve never been on a cruise before and any opportunity to win a cruising holiday is not one I’m going to surpass; all the more so when I learned that Celebrity Cruises have recently been voted Ocean Cruise Line of the Year in the 2014 Food and Travel Awards. 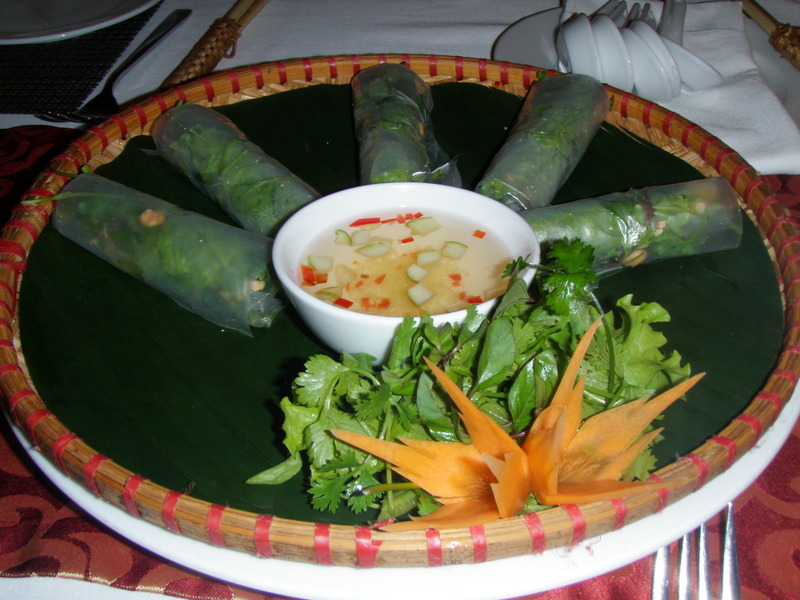 A visit to Vietnam last year completely changed the impression I had of this classic starter. Having previously only tasted the crispy and often greasy spring rolls found in restaurants in the UK, these authentic Vietnamese ones were encased in a supremely soft, rice paper shell, packed to the brim with a delicious crunchy filling composed of ground pork, shrimp, glass noodle and fruits such as pineapple – is it any wonder I was so reluctant to share?! These particular rolls were found at Essence Cafe in Hanoi but you’ll spot these on every corner on the streets and in restaurants. You can read all about some of Vietnam’s best eateries here. For my main course, I was going to share with you another low key, authentic local dish, this time from Bali but when it comes to dining and great cuisine, variety is the spice of life. I kept it simple with the starter so now I hope to wow you with my main. 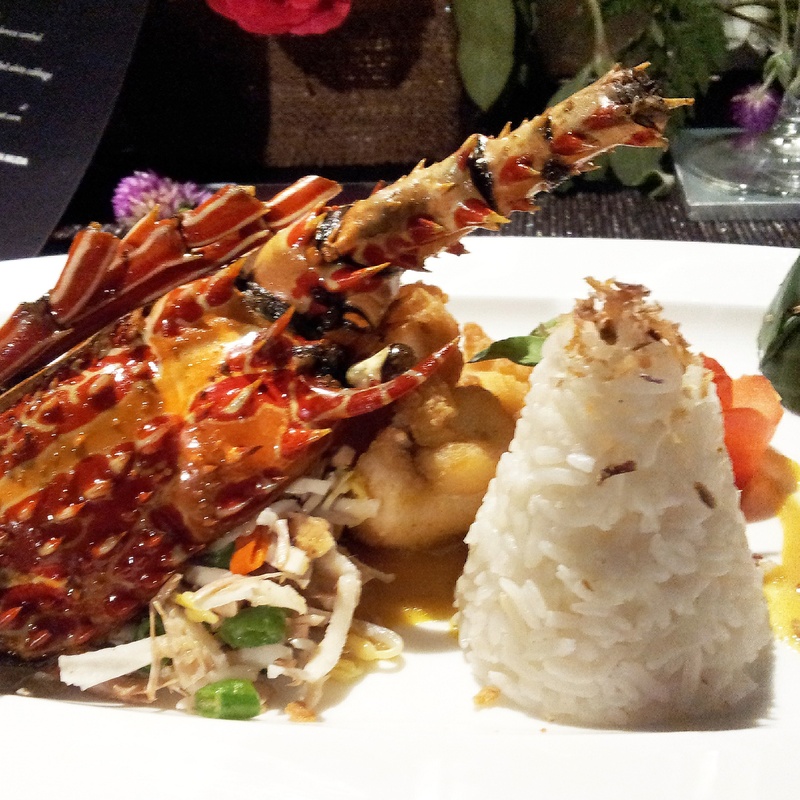 Let me introduce you to this traditional Indonesian stir fried lobster, which I sampled at a rather swanky Chef’s Collaboration Dinner hosted by the Kayumanis Hotel Group. I’ll be writing more in due course all about this event but in the interim, let me just tell you that this Balinese lobster flavoured with garlic and ginger paste and served with a side portion of rice and grated young jack fruit was one of the finest culinary delicacies I’ve ever been lucky enough to sample – on my travels and at home. The lobster was lightly battered and perfectly succulent – if British chip-shop fish won the lottery and moved to Beverley Hills to start a new life, this is how it would resurface. I mopped up the entire plate. It would be rude not to – after all, how often does one get to enjoy a lobster course as part of a seven course meal in a location as magical as Bali? When I visited Slovenia earlier this year, I embarked upon a food tour in the charming capital city of Ljubljana. For a travel blogger who loves her food, this turned out to be one of the most stimulating ways to spend an evening, not least because it introduced me to this absolutely irresistible cuboid cake. Made from buckwheat flour, chestnut, almond, honey, fig and of course saving the best till last – chocolate! The moistness from the honey and figs combined with the multi-textured nuttiness makes it one of the most unusual but inviting cakes I have ever tasted. 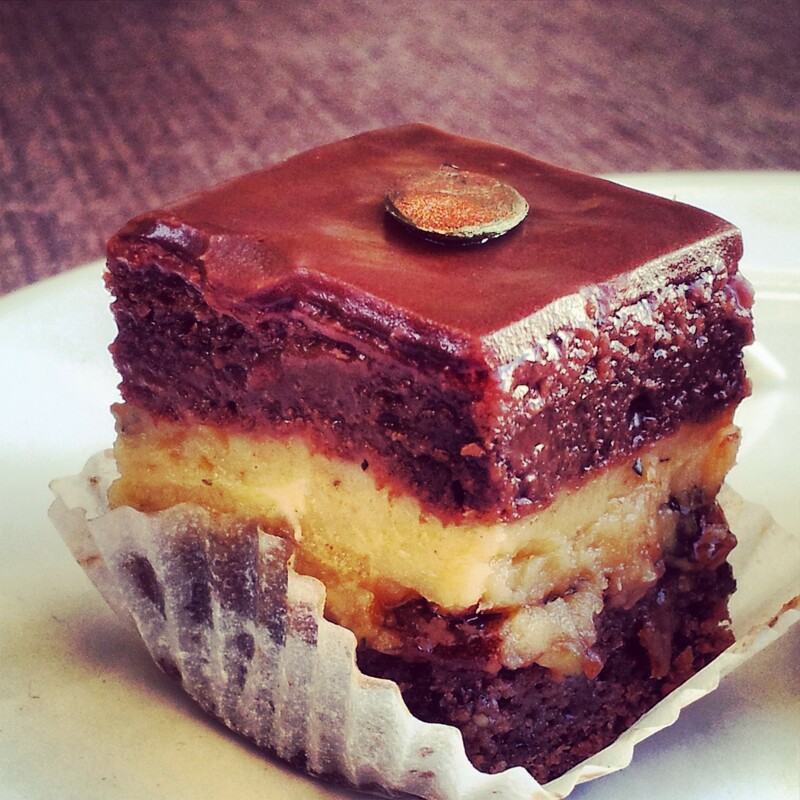 Just look at the layer upon layer of temptation in this photo! Does anyone think they could stop at one bite? I certainly couldn’t and ended up buying myself a very naughty whole cake to savour at home. How long do you think it lasted in our house – hours or days?! As the final part of this competition, I need to challenge four other bloggers to join me at my dinner party and to devise their own three-course menu. 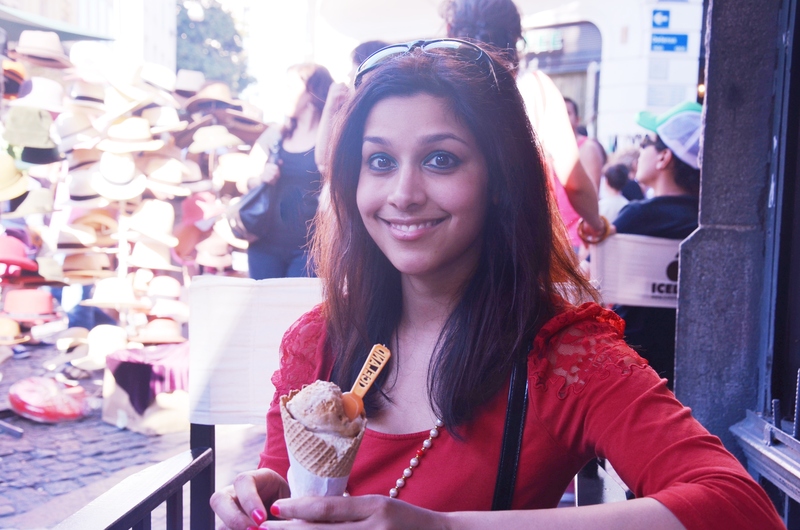 I’ve selected four fellow travel bloggers, all of whom I know have a palate for great food. I’m looking forward to reading your menus Spilling the Beans, Life on my Plate, Love and Limoncello and Lines of Escape. Have I tempted you with any of these dishes above? What have been your favourite foodie highlights from around the world? Thanks Suzanne! You too 🙂 I remember reading your menu that kicked off this competition didn’t it? The cake, although looking like a normal chocolate cake, had so many unusual flavours and textures – it was divine! I’m so jealous that you’ll be back there – it’s just such a foodie paradise out there, I don’t think I had a single bad meal while I was there! Enjoy it out there! Sorry Tim – I hope I didn’t make you too hungry 🙂 It was really quite hard picking just 3 dishes from around the world, which is probably why these 3 (all from within the last year or two) sprang to mind! Thanks so much for reading. …and what a menu! So many mouthwatering flavours! Great menu! I remember reading your Slovenia posts and drooling then, now I’m drooling again! And oh my goodness – that lobster!!! Wow!! What a menu, Shikha 😀 Needless to say I’m hungry now – the intriguing dishes, the inviting photos, and the tasty descriptions! Thank you for the lovely comment Nita 🙂 I’m so sorry that you aren’t able to actually enter but like I said before, I’d love to know your 3 favourite dishes! Oh god I’m drooling so much!! Why oh why does the dessert have to have so much nuts in?! 😦 I can always dream I suppose. I’ve never tried lobster but that dish looks fab. Does the lobster have spikes though?! I have no idea how I would narrow my own choice down to just 3 courses! This place is so lovely!! I totally love the ice cream and the cakes ❤ Omomomom! I’m so glad you like the look of the cake as much as I did Agness 🙂 These were a collection of my favourite dishes from around the world but it was hard to pick! Wow those look fantastic – spring rolls are just about my favourite Asian food. And I was already planning to visit Ljubljana next year but that cake has sealed it for me!